Enjoy this sneak peek of Playing Preschool! Playing Preschool is a dynamic new homeschool preschool curriculum from the creator of Busy Toddler. The 38 week program spans the length of a traditional school year and covers 19 thematic units. Unit 1 is Apples and one of my favorites. 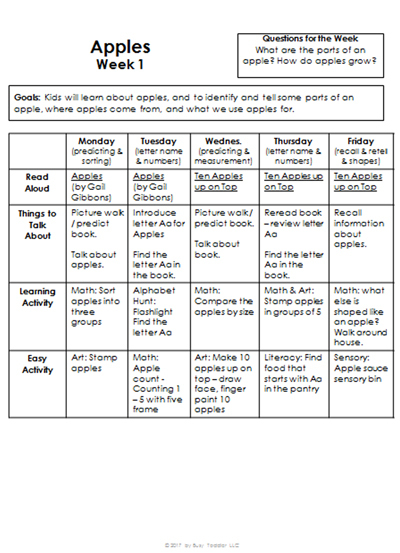 In this two week unit, children use apples as tools for learning, build vocabulary words and learn more about sequence (hint: the life cycle of an apple). WANT TO LEARN MORE ABOUT THE WHOLE PROGRAM? CLICK HERE! 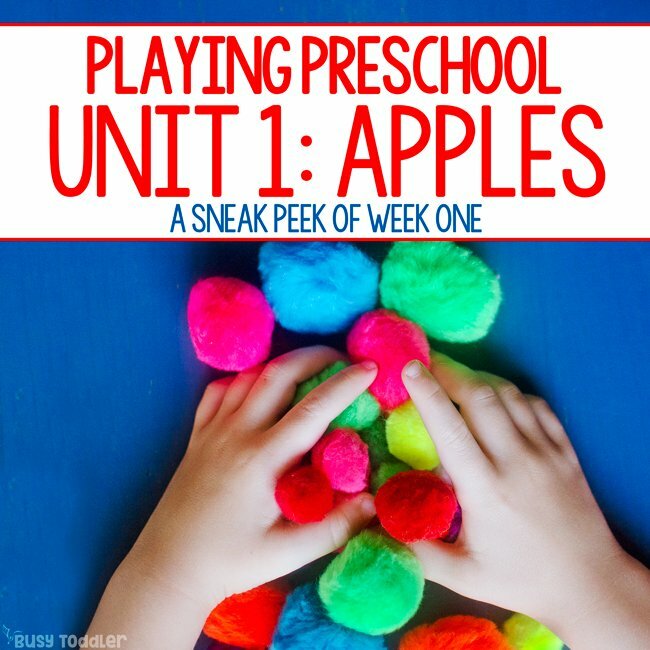 I’d love to give you a preview of Playing Preschool Unit 1! 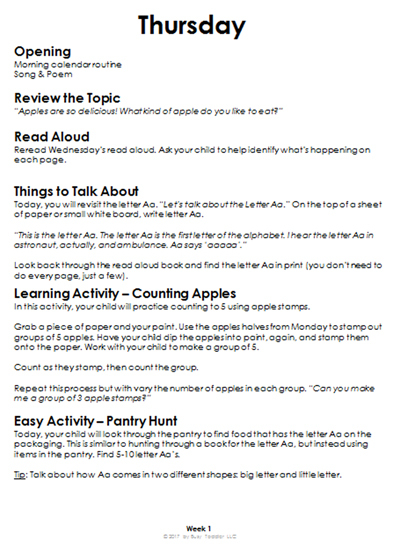 I know picking a learning program for your preschooler is a tough one. 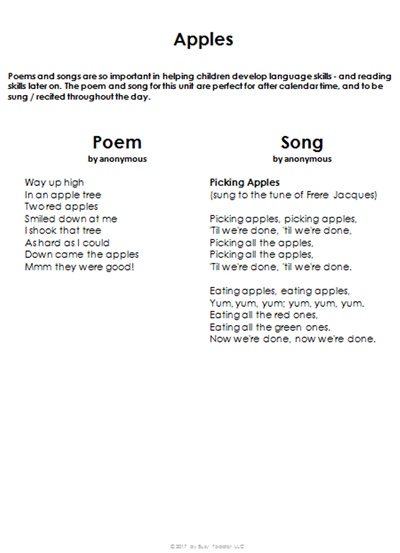 Let me give you a preview of the first half of Unit 1: Apples so you can see what Playing Preschool is all about. 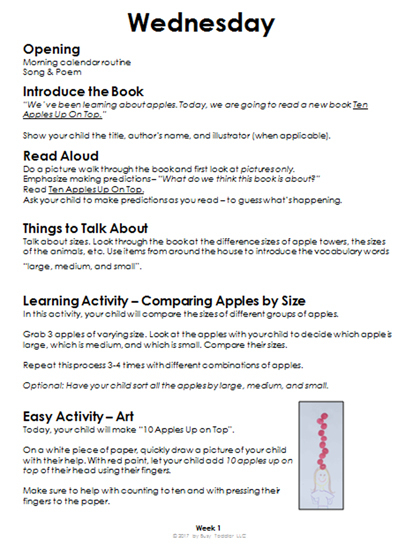 Enjoy Playing Preschool Unit 1: Apples! Oh and just an FYI (I know it goes without saying but I have to say it): Please respect the effort and expense incurred in producing this resource. No part of the Playing Preschool Program may be reproduced in any form nor transmitted by any means, electronic or mechanical, including photocopying, recording or by any information storage and retrieval system, without written permission from the author. © 2017 Busy Toddler LLC. All rights reserved. Are you ready to get Playing Preschool for your family? The complete 330+ page curriculum comes with my amazing Start Up Guide, which is jam packed with all the extra information you need to use Playing Preschool in your house. You’ll learn more about how I made this program, why I set it up the way I did, what your child will be learning, and all my tips and tricks for teaching it in your home. BUY THE WHOLE PROGRAM TODAY AND GET STARTED! 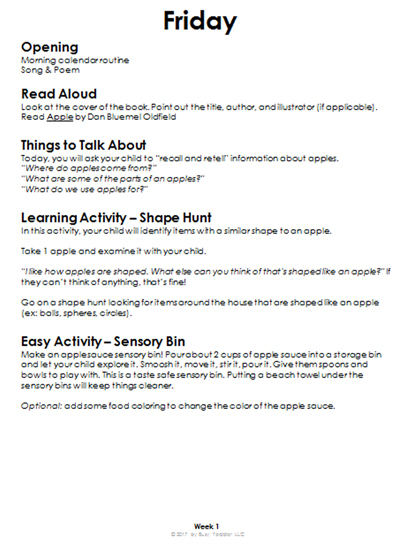 Playing Preschool is great for building background knowledge to get our kids school-ready. Join me on this early learning adventure! You can learn even more about Playing Preschool in this post or by visiting my shop! The path to home-based learning starts today! I was looking thru your sneak peak and I absolutely love your curriculum. I cannot wait to be able to get it for my two year old. Do you provide links to the read aloud so that we could read those online? Or would we first need to have those books purchased? Thanks in advance! Hi Raida! Thanks so much for the interest! I actually recommend you do NOT buy the books mentioned – but instead check them out from your local library. Buying books is so expensive, and you should only buy the ones you really really fall in love it. I had so much fun checking these out from my library. If you can’t find one that I listed, just pick any other book in that subject. 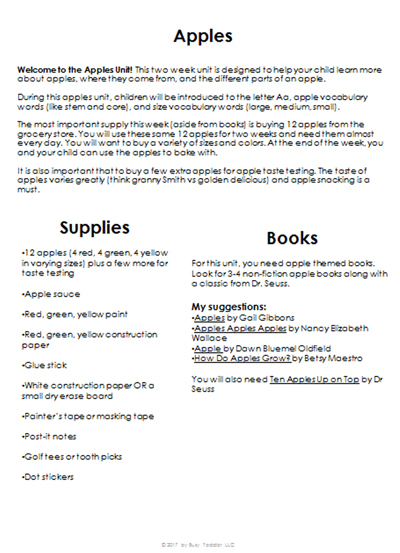 I made the program so parents could use books they have or what they can find, rather than buying them all. Cheers! 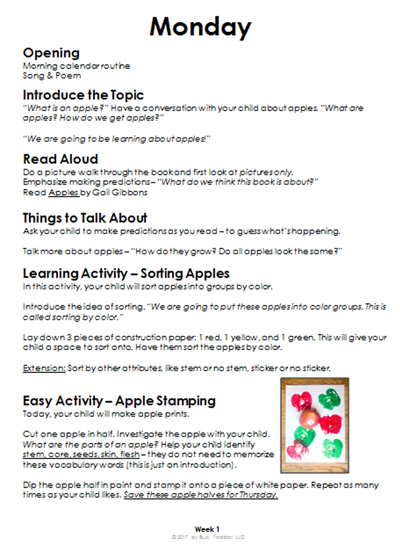 Very excited about your play preschool curriculum – thanks for sharing the sneak peek! Curious to better understand how you decided to sequence the units around the alphabet. I noticed you didn’t take the traditional approach of going in order (i.e., Unit 1 focuses on A, Unit 2 focuses on B, etc). 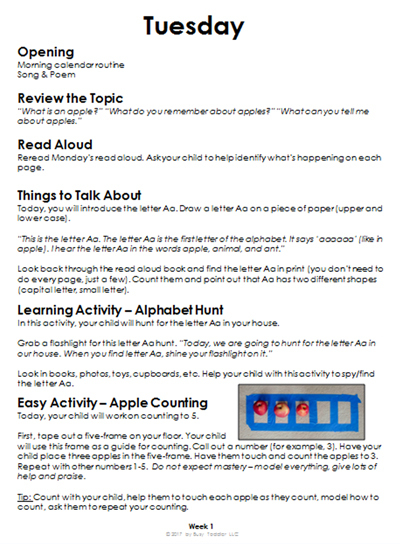 Can you share more about how you decided which letters and topics to include first, versus later in the 19 units? Thanks so much! Hi Katie, I chose to mix up the letters for some very specific reasons: 1. I don’t want my kids relying on order to help them remember this. I want the relationship to be with each individual letter and not dependent on knowing the letter before or after. So I mix them up as I introduce them. 2. Sometimes, I made the unit and the letter fit together, like A for Apple and Q with U for Things that Go Together. I’d rather kids make connections to letters through units than through alphabetical order.